Forming in 1997 after several failed band attempts, and performing as hired guns for other musicians, Michael Trapp and Matt Wells hooked up to form Bliss. Handling all the instrumentation and the majority of the lyrics, Michael Trapp creates the foundation for Matt Wells to come along and lay the vocal workings on. 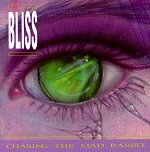 Fusing 80's metal with a pop touch, Bliss can best be described as being a bit too late in their musical visions. The majority of the songs sound like bad crosses between metal and pop, much like the majority of the MTV bands in the 80's. Having lived through that period in time, I've always hoped music would never take a regressive dive like that. Listening to Bliss gives me terrible flashbacks to the days when Axl rose's shriek could be heard all over MTV and Def Leopard could score a hit with anything they put their fingers on. But some of the music does ascend past the 80's reputation it builds for itself. "Once Upon A Time" is a beautifully crafted soft-rock number that gently combines hooks with a laid-back feeling. The vocals, on the other hand, get stuck in the metal-gone-soft phase and help drag the song down. Hopefully, the fact that Tommy Stinson (ex-Replacements' bassist) has joined Guns N' Roses isn't a sign that metal is making a comeback. But if it is, Bliss might just fit in. Otherwise, they sound out of place in the 90's music community. Besides sounding out of place, they're too reminiscent to really make you want to listen (unless you're stuck in the 80's). I'll give this disc a D.
Blink 182: Dude Ranch Blister Rust: Who's Gonna Scratch Your Itch?! !